Frank Stuehrenberg, born in 1963, studied Economic Sciences with a main focus on Business Informatics at the University of Paderborn, Germany. Frank Stuehrenberg has been working at Phoenix Contact GmbH & Co. KG since 1992. The company is the worldwide market leader of components, systems and solutions in the area of electrical engineering, electronics and automation with 17,400 employees worldwide and had a turnover of 2,38 billion euros in 2018. Frank Stuehrenberg started his career at Nixdorf Computer AG in 1989. In 1992, he joined Phoenix Contact as Assistant to the Management of Sales, Marketing and Development. In 1995, he became Director of the International Key Account Management and 1998 Director of National Sales. 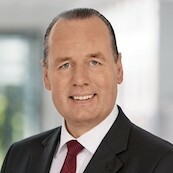 In 2001, Frank Stührenberg was appointed as a member of the Executive Board of Phoenix Contact and since January 1, 2015, he has been Chief Executive Officer (CEO). Frank Stührenberg is a member of the external trade committee of the Federation of German Industries (BDI) and the German Electrical and Electronic Manufacturers’ Association (ZVEI e.V.). He is also a member of the Board of Directors and Treasurer of the ZVEI.